Printed circuit boards are usually made of fiberglass (FR4), which is highly abrasive and given the many hundreds or thousands of holes on modern circuit boards, requires the use of specialist drill bits. 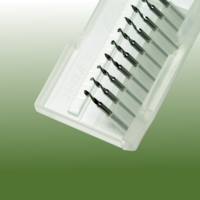 PCB Supplies supplies the highest of quality Drill Bits manufactured by Union Tools. These Drill Bits are made of top quality Tungsten Carbide. This is a ST Series drill bitThe ST Series are a universal drill bit, which can be used for many materials.